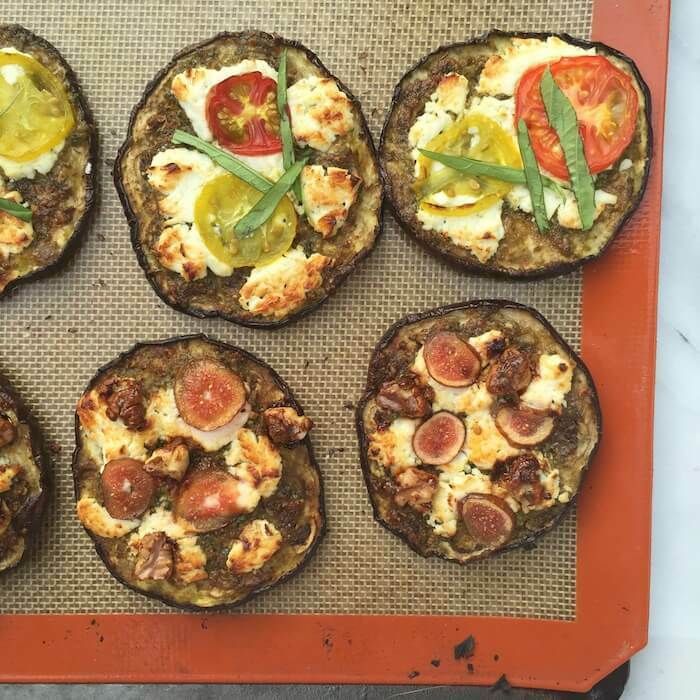 Baked Eggplant Pesto Pizzas featuring a homemade basil parmesan pesto can easily be customized with your favorite ingredients like ripe summer tomatoes or goat cheese to feed your entire family a healthy, gluten-free and vegetarian-based meal. We’ve had an amazing summer of picnics and spend-the-night parties in Ellie’s tent but from sleep to meal times, we are definitely out of our routine. 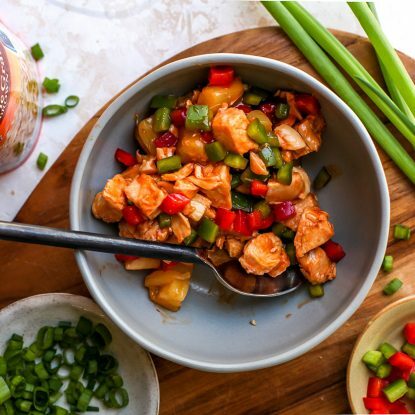 This month, the theme for The Recipe Redux is to share family favorite recipes that help get back to the dinner table. 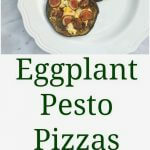 Since fresh basil, eggplant, tomatoes, and a plethora of other vegetables are still fully in season and in abundance here in Alabama, I thought it would be fun to do a twist on my girls’ favorite meal, pizza. These eggplant pesto pizzas skip the bread and tomato sauce and use freshly sliced eggplant as a base. They’re then topped with a simple homemade basil pesto, cheese, and other ripe summer produce before baking. 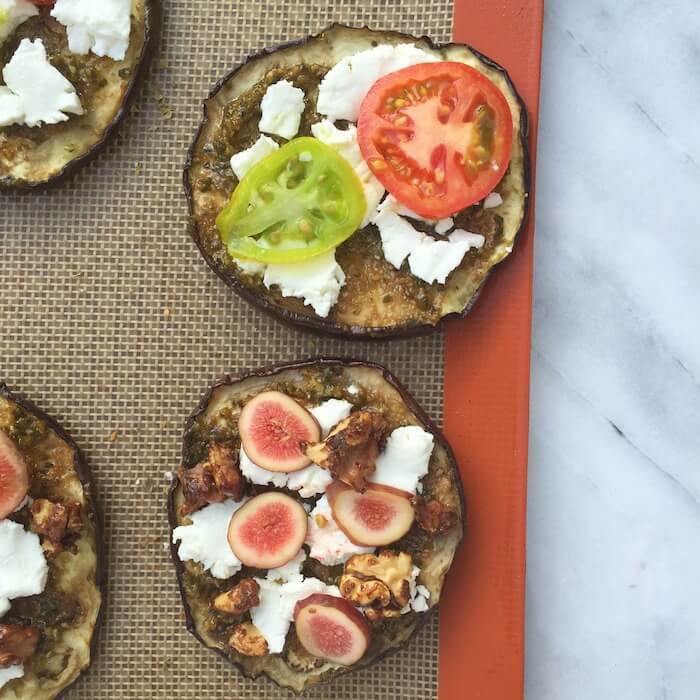 In this recipe, I’ve used goat cheese on both pizzas and then topped one with tomato and basil and the other with fresh figs, candied walnuts and goat cheese. A drizzle of good balsamic over each of the pizzas before cooking adds the finishing touch. 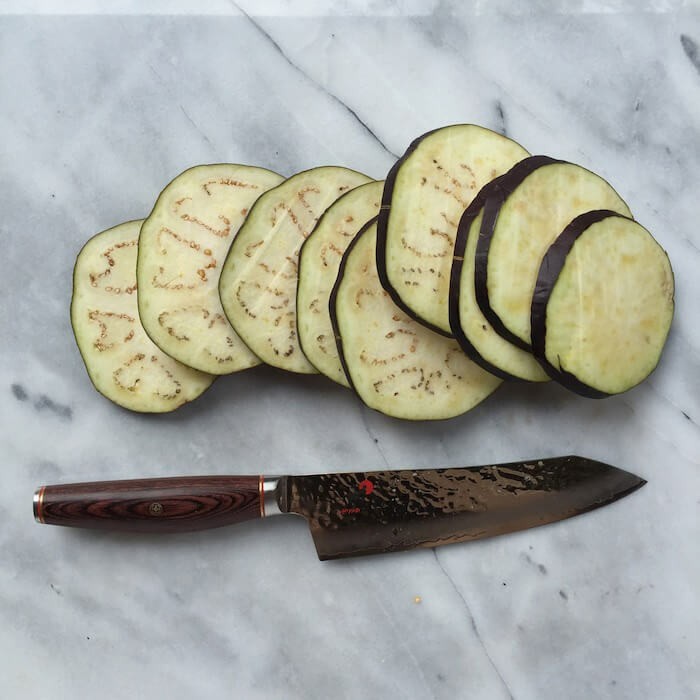 Make sure to follow the directions for salting the eggplant to achieve the best-tasting and texture “crust” (ie. eggplant). I like to salt the slices for about 30 to 45 minutes to allow as much excess bitter moisture to be released. Don’t panic about adding too much salt to the eggplant. You’ll rinse and wipe most of it away and what stays adds flavor. Note that the eggplant may look a little shriveled (because, hey, you just dehydrated it). While my young, “selective” girls weren’t too sure about these pizzas (they understood “pizza” but just weren’t sure about why it looked different than what they were used to), they had fun helping me choose toppings and “decorating” the pizzas. Have we connected on Facebook, Twitter, Instagram, and Pinterest? If not, what are we waiting for? 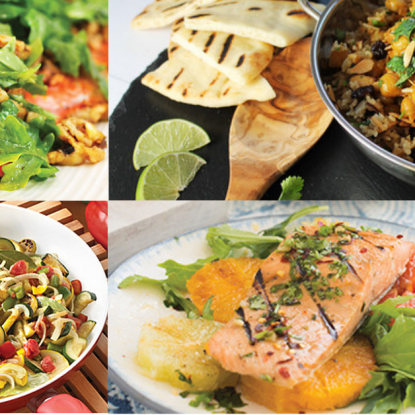 I love to share practical, doable, and delicious recipes and nutrition tips for the family. Optional Toppings: goat cheese figs, candied walnuts, tomatoes, basil, mozzarella, balsamic vinegar, etc. Cut eggplant into 1-inch thick rounds. Lay flat on paper towels and generously sprinkle with kosher salt. Allow to sit for 30-45 minutes. Wipe moisture off eggplant, rinse in cold water, and press between paper towels to remove as much excess moisture as possible. 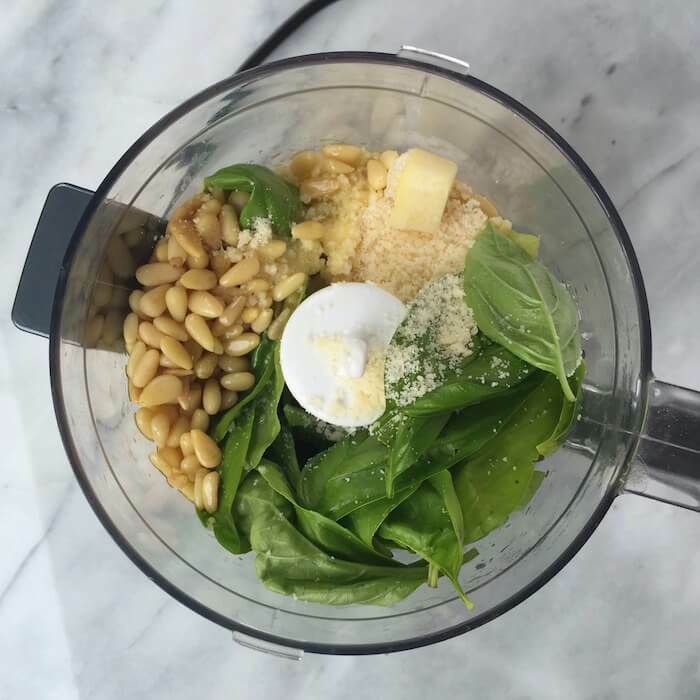 While eggplant sits, preheat the oven to 375 F.
To make the pesto, combine basil, pine nuts, olive oil, parmesan, and garlic in a food processor and process until desired texture. 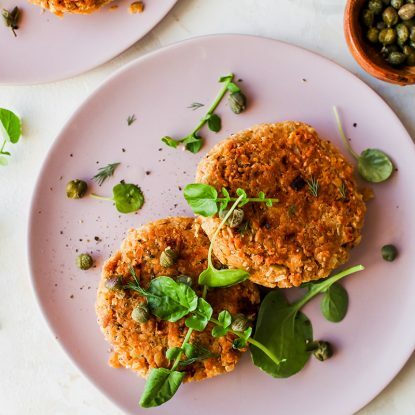 Place the eggplant slices on parchment paper or a baking mat and bake for around 25 minutes or until the eggplant is tender. Remove from oven and spoon pesto evenly over eggplant slices. Add desired toppings and broil 1 to 3 minutes (or until cheese browns).